Going into the final game of the season, Boston batsman Dave Newman needed 113 runs to reach 1,000 for the season. At the close of the South Lincs & Border League champions’ innings, the opener was unbeaten - on 114. And in a last gasp race to take the most wickets in the season, Newman’s teammate Scott Elleray grabbed six for 39 to finish with 45 wickets. Boston wicketkeeper Matty Hood came close to making it a hat trick of trophies with 26 dismissals, but was pipped by Long Sutton’s Adam Wright with 28. Ben Bulmer hit 50 in Sleaford 2nd’s three wicket win over Belton Park to finish second to Newman in the runs list while Will Taylor went out on a high note with 125 for Lindum Ramblers against Moulton Harrox, the weekend’s only other century. Matt Benson took three wickets for Ramblers to finish two behind Elleray with Long Sutton’s Jake Burton third with 42 after claiming another five wicket haul. However, this performance in the last match of the season wasn’t enough to prevent a win for Grantham 2nd, for whom Danny Ashley also took five. Billingborough 2nd’s Mike Stanley tops the Division One batting figures with 791 runs, a double cause for celebration after his side picked up sufficient points in their final match to move out of the relegation zone. Billingborough took eight of Market Deeping 2nd’s wickets, five of them falling to Mitch Griffiths as Deeping reached 220, Richard Witt hitting 71. Tim Bell was the league’s only bowler to top 50 wickets, taking 52 for Boston 2nd who finished second in the division behind Deeping. Third beat fourth as Freiston got the better of Cavaliers and Grantham 2rd beat Heckington by eight wickets. League newcomers Grantham 4ths may have finished bottom of Division Two after going down to Boston 3rd but Ian Robinson gave them cause to celebrate, hitting 71 to take the batting trophy with 639 runs. Baston celebrated their division championship with a win over Spalding 3rd, Adam Hilless hitting 51 and also taking two wickets to win the bowling trophy with a total of 40 for the season. 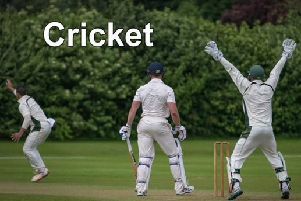 And in an eventful game at Spalding Grammar School, Nick Crook bowled four overs with two maidens and took five wickets for just two runs as Graves Park were all out for 150, John Morris making 72. Crook then went on to hit 52 runs with Lee Smith unbeaten on 84 as Pinchbeck claimed a four wicket win. RESULTS: Premier Division - Boston 222-4 (Newman 114no), Stamford 50 (Elleray 6-39); Grantham 2nd 180 (Burton 5-37), Long Sutton 51 (Ashley 5-27); Lindum Ramblers 269-5 (Taylor 125), Moulton Harrox 49; Belton Park 192 (Lewis 64), Sleaford 196-7 (Bulmer 50); Division One - Market Deeping 2nd 220-8 (Witt 71, Griffiths 5 wkts), Billingborough 2nd 110 (Andrews 5 wkts); Freiston 121, Cavaliers 77 (Aazeer 58); Heckington 56, Grantham 3rd 57-2; Division Two - Baston 136 (Hilless 51), Spalding 3rd 93; Grantham 4th 97-7 (Robinson 71), Boston 3rd 99-1 (Roberts 57); Graves Park 150 (Morris 72, Crook 5-2), Pinchbeck 151-6 (Smith 84no, Crook 52); Burgh & District conceded to Claypole.